Aloe Vera is a brilliant species of plant that has been used by cultures across the globe for thousands of years to heal the human body of illness and injury. More than 3,000 years ago the Egyptians were using it for skin problems and infections. Today many natural eczema and psoriasis remedies contain aloe for its soothing and moisturizing properties. The saponins in the plant act as a natural cleanser and an enzyme called bradykinase reduces inflammation. This has a pain killing effect which accelerates the healing of wounds and reduces scarring. One lesser known use for aloe is to calm the digestive tract and bowels. The plant contains polysaccharide sugars that enter the bloodstream to boost the body's immune system by attaching to the lining of the stomach. For people who suffer from irritable bowel syndrome (IBS) or ulcers this has a calming effect. Aloe also helps relieve symptoms of osteo and rheumatoid arthritis. When shopping for products to remedy these illnesses look for those with the highest concentration of aloe vera gel. They are more expensive but when it comes to aloe you get what you pay for. If you fancy an exotic, spiky plant to decorate a sunny area of your house you could always buy yourself an aloe pot plant. There are 300 varieties but go for the most potent variety - aloe vera barbadensis. Cut a little off and squeeze the gel from the centre of the leaf for an instant relief to sunburn. 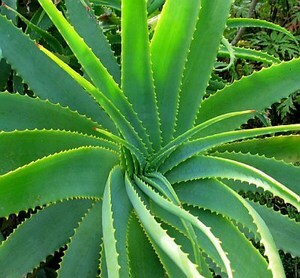 For more info on the healing properties of aloe vera visit the International Aloe Science Council.